Few blues artists have given me so much enjoyment through their recordings as Southern California harmonica player William Clarke, both before and after his untimely passing 10 years ago. Imagine my excitement when I received an email from Clarke's widow, Jeannette, advising me that she had independently released two volumes of material that had just been sitting around, mostly unlabeled with no recording dates. The 27 recordings on the two volumes were recorded mostly between 1975 and 1985, prior to Clarke's signing with Alligator Records for whom he recorded four albums from 1990 through 1996. While Clarke had previously recorded and was already known for his innovative harmonica style, his association with Alligator gave him international renown among blues fans. The four Alligator CDs deserve a prominent spot in every serious blues collection. 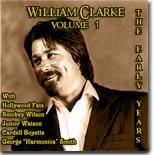 The quality of music on The Early Years is every bit as good as anything Clarke recorded during his career. There's not a weak cut to be found on the two discs. The session information is sketchy at best, but what's known is that Clarke was at times joined on these recordings by some of the best L.A. area blues musicians: Hollywood Fats, Smokey Wilson, Junior Watson, Cordell Boyette, Ronnie Earl, Johnny Dyer, Mitch Kashmar, Rasheed Abdullah, and the man who was the major influence and spiritual leader for all SoCal harp players, George "Harmonica" Smith. Volume One opens with a pair of instrumental numbers, the up-tempo shuffle "Hittin' Heavy" and the slow "Blues Afterwhile," both of which reflect a heavy Little Walter influence in Clarke's harmonica playing. The absolutely excellent "Diggin' My Potatoes" is the first chance for Clarke to step up to the microphone on this collection. While still containing the gritty, "back alley blues" quality of his Alligator era, Clarke's voice has a more youthful sound on the earlier recordings. The interplay between his harmonica work and Hollywood Fats' guitar work is sublime. This is a song to be heard over and over again. "Teenage Girl" is the first cut on Volume One to feature Smith, who does the vocals but apparently does not play harmonica here, leaving the harp playing to Clarke. It's a good, up-tempo blues. We get to really hear the guitar genius that was the late Hollywood Fats, who takes over on the urgent shuffle "Come On Baby." These two guys sounded great together ... it's sad to think of how much wonderful music these two could have made together had Fats not left us in 1986 at the age of 32. "Teardrops Fallin'," a George Smith song, lets us hear Clarke's work on the chromatic harmonica. While he's not credited, it's apparently Smith on the vocals here ... a great slow blues with nice slide guitar (guitarist unknown). Smokey Wilson makes his lone appearance on the mid-tempo "Fine Little Mama," playing guitar and singing in front of a band that also included guitarist Rick Holmstrom and pianist Fred Kaplan. Holmstrom, who first came to prominence with his 1990s work with Johnny Dyer and with The Mighty Flyers, must have been a young kid when this cut was recorded, but it shows that he already knew his way around a recording studio. He was a member of Clarke's band in the late '80s, which may help to place the date of this recording. Cordell Boyette (aka Louisiana Guitar Red) is featured on his own composition, "I Miss You So." Boyette's rawer sound is contrasted nicely by Clarke's jazzier playing on the chromatic harmonica. 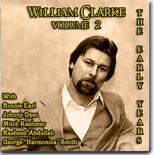 Volume Two opens with a good, basic blues, "Early In The Morning," with an unknown band backing Clarke. It's followed by a slow blues, "The Feeling's Gone," with nice piano accompaniment from an unidentified source and a strong harp solo from Clarke. Smith returns for a slow blues on an "Untitled Tune," and is credited for both vocals and harp, while Clarke also plays harmonica. For lack of substantive session information, we'll assume that Smith does the chromatic solo at the beginning of the song while Clarke backs him on the regular, 10-key harmonica. There's also a tasteful guitar solo near the end of the cut; while the session info indicates that the rest of the band is unknown, Smith is heard urging on a 'Craig', so the assumption is that the guitarist is Craig Printup, who appears on several of Volume One's cuts. Guitarist Ronnie Earl shows up in the credits for the long, slow blues of "Bloody Tears On My Pillow," a Clarke original that rivals the best of his Alligator recordings. Following that number is a fine version of John Brim's "Ice Cream Man." Johnny Dyer makes his only appearance on the Sonny Boy Williamson number, "So Glad I'm Livin'," a slow stop-time tune which also features Holmstrom on guitar and simultaneous harmonica playing from Dyer and Clarke. Another number that features dueling harps is the mid-tempo instrumental "Horn Of Plenty," with Clarke and Mitch Kashmar trading riffs. Kashmar's regular backing band from that era, The Pontiax, are credited as the accompanying band. Volume Two closes with three excellent live cuts, presumably recorded in 1987 for a future Rivera Records album: "I Had My Fun," "Deal The Cards," and "Boogie Woogie Woman." Appearing with Clarke that night were Joel Foy (guitar), Willie Brinlee (bass), Fred Kaplan (piano) and Eddie Clarke (drums). In addition to giving the listener a chance to hear Clarke at his best, which was performing live in front of a receptive audience, this trio of songs also showcases the brilliant piano playing of Kaplan, who is still active on the Southern California blues scene. It's really hard to find anything wrong with this excellent collection. If I have to critique anything, it's that the liner notes are sometimes a little hard to read due to the print quality and there are a few misspellings. But those are very, very minor nits. After all, we're here for the music. Quite frankly, the blues doesn't get much better than this. Get it while you can, because unless some record company gets these two volumes into much-deserved wider distribution, they probably won't be available very long. Don't miss out on some of the best blues to be released in 2006. If you can't find the CDs on Amazon or eBay, try checking in with Jeannette Clarke-Lodovici at JLodovici@aol.com. All contents Copyright � 2006, Blue Night Productions. All rights reserved.